Trouble using the new UI? This is the new user interface (UI). The buttons are Edit Page, Create New Page and More Actions. Here we have clicked More, then Manage site and selected Site layout. NOTE: Site layout has been moved to More>>Edit Site Layout. See this page for more help. Some of the information in this section might still be useful so I'm leaving it for now. Note that we have the Save, Preview and Cancel buttons in the top bar which remains fixed while we scroll up and down in the bottom section. Here we have clicked More and selected Sharing and Permissions. Anyone with the link, and Private will appear along with the Save and Cancel options. Here we have clicked Change. See the Save and Cancel buttons. When we configure navigation note the OK and Cancel buttons on the window. If you have a problem viewing the User Interface please make sure that you are using the current version of your Web browser, or if you use Internet Explorer version 8 or 9 make sure that you are not in compatibility view mode. You have the option a reverting to the old user interface. 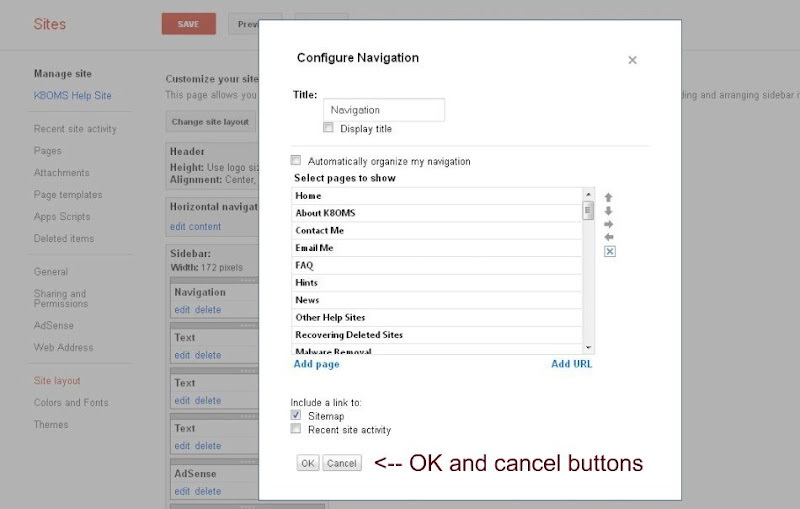 Click the settings icon ("gear" or "cog") in the upper-right, select user settings and remove the check next to "Use the new look". This option is no longer available.